What does it mean to "protect your hand" in poker? 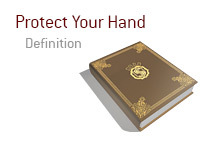 What is the definition of the term "protect your hand"? If you have ever played any live poker, you have likely heard the term "protect your hand" being used. The term does not apply to online poker, as online poker software will not allow the virtual dealer to make any mistakes such as accidentally mucking a hand or another player to toss their cards onto yours. 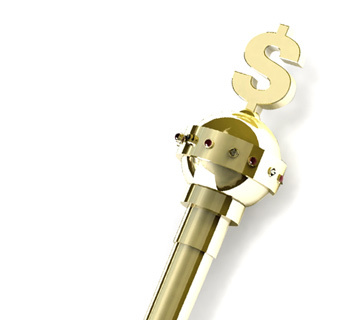 Do you ever wonder why players will put chips or some sort of small item (like a coin or figurine) or their cards? They are "protecting their hand". Let's say that your cards are unprotected and sitting on the table during a hand. The dealer may accidentally muck your hand and sweep your cards into the muck over the course of a hand. What happens then? If you had something to protect your cards, the dealer would almost certainly not muck your hand as you had something in place to protect your cards. Let's say that you are in a hand and your hand is unprotected. What happens if another player mucks their cards by tossing them and the cards land on top of yours? This would be another situation that could have been avoided by protecting your cards. If another player DID toss their cards on top of yours, both of your hands would be declared dead even though you did NOTHING wrong. That is why it is important to protect your hand.